The Monday Night Football win over the 49ers gives the Giants momentum as they welcome ex-star Jason Pierre-Paul and Tampa Bay. The New York Giants' prime-time commitments for the 2018 season are through. From here onward, Big Blue will play at 1 p.m. every Sunday until the calendar rolls to 2019. That's where 2-7 teams belong. And yes, Monday night's 27-23 win on the road against the equally woeful San Francisco 49ers was far from a disaster. That doesn't mean the rest of the country should be stuck watching NFL bottom-feeders vie for a prime NFL draft slot in a showcase time slot. The Tampa Bay Buccaneers (3-6), visiting MetLife Stadium on Sunday, are barely better than the Niners (2-8). Still, the matchup could shape up to be entertaining. Here are three storylines that make the Week 11 game interesting. While Jason Pierre-Paul hails from Florida, his offseason acquisition by Tampa Bay — which shares Raymond James Stadium with his alma mater South Florida — came after the talented defensive end played the first eight seasons of his NFL career in East Rutherford, New Jersey. He's back in town for the first time since the March trade, which netted the Giants draft picks, and his comments to reporters make no secret of this being a game for which JPP has some extra motivation. With eight sacks in nine games, he's on pace for one of his three best single-season sack totals. With so much turnover on the Giants' offensive line, Pierre-Paul won't line up across from many familiar faces. He will, however, be in search of his first career sack of Eli Manning. Not even the highflying Kansas City Chiefs can match the gaudy passing yards the Bucs are racking up this season. As a team, they lead the NFL with 361 yards per game through the air. Tampa Bay also ranks among the worst at defending the pass, offering Manning a chance to extend his success against San Francisco into this week's matchup. The two-time Super Bowl winner posted his first three-touchdown, zero-interception game in nearly two years on Monday, and he could repeat the effort against a weak, banged-up Tampa defense. 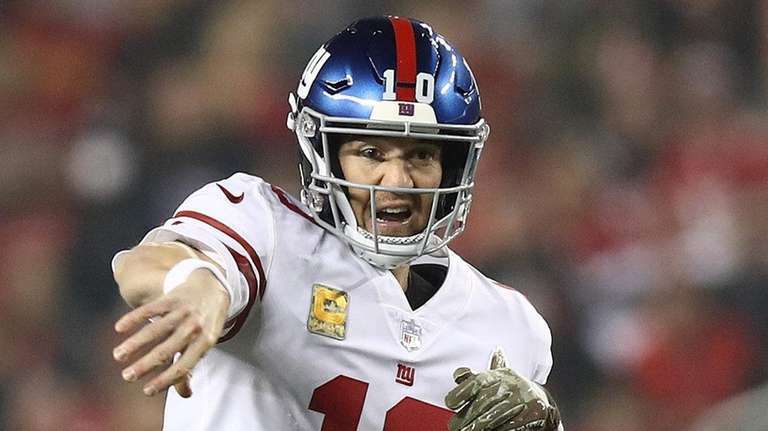 At the same time, former Jets quarterback Ryan Fitzpatrick could match Manning step for step in what may shape up to be a virtual track meet at MetLife Stadium. Eleven teams enter Week 11 with one, two or three wins. Both the Giants and Bucs are squarely in that group. Forget any ideas of tanking here. These Giants clearly haven't packed it in yet and Tampa Bay coach Dirk Koetter is on the hot seat — losing does no favors for him or his players. But a win by either club would hamper their prospects of securing a top-five pick in April. Keep that in mind the next time the Giants are driving down the field with a chance to win the game.